Silk Tree Nurseries graft and grow a wide range of edible, wine, and ornamental grape vines, all of which are hardy in the UK climate, and will give reliable, heavy crops each year. If you are looking to plant a small vineyard or large arbour, then please contact us for quantity discounts if ordering more than 25 vines. We can also supply in vineyard quantity. The majority of our grape vines are grafted onto disease resistant SO4 rootstock. Ideal for the UK climate because, as the name suggests, it produces grapes earlier than most varieties, this is a lovely flavoured white grape vine of medium size. This grape vine, Boskoop Glory, is often mistakenly sold as a 'wine grape', but it is in our opinion one of THE best edible grapes you can grow in the UK climate. It has a really exceptional flavour, with medium sized grapes produced in quantity, even on a small 3-4ft vine. 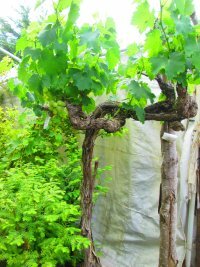 This is a fast growing grape vine, needing support such as a trellis, pagoda, or fence, or can be grown up and around another climber, or tree. Fruit WILL ripen in this country and you will have edible grapes a year after planting this vine. A very rarely available Strawberry Grape Vine (Vitis labrusca hybrid) which is early ripening with disease free blue table grape, sweet flavoured. A famous full flavour grape producing a distinctive wine known the world over. A very rarely available Strawberry Grape Vine (Vitis labrusca hybrid) which is early ripening with disease free blue table grapes, sensational big clusters on a strong growing vine. Grafted. Limited availability. This very well know variety of grape, Chardonnay, is grown in the millions in vineyards around the world because of it's high sugar and acid content. It used in dry, sweet, and sparkling wines. It is a heavy cropping variety that should reward you with enough grapes to attempt home brew Chardonnay every year. 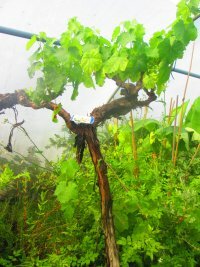 The vine itself is vigorous, and can cover a pagoda or trellis easily in one year. This concord variety of grape is a strawberry grape vine (see description of Niagara below) with a very distinct flavour. A delicious dessert grape that can be also be used to make wine (popular for American varieties). Limited number available this year. Vitis 'Dornfelder' is a cross between the Helfensteiner and Heroldrebe grape and has produced a grape that is large and full of juice, so this vine is a good choice if you like squeezed grape juice. Dornfelder is also becoming popular in the vineyards of Germany, where it is used to produce full flavoured, fruity, deep red wine. The Himrod variety is a full flavoured white SEEDLESS grape which will fruit in this country and is fully hardy. This is a commercial vineyard quality GRAFTED vine. Vitis Madelaine Sylvaner is one of the best outdoor white eating grape for the UK climate. This is an early cropping variety which will produce fruit in abundance and is reliable each year. It is disease resistant, and can be grown in a south, east, or west facing garden. Vitis Merlot is a purple/blue grape with a distinct fruity flavour. We are very pleased to be offering a range of 'Strawberry' grape vines that are extremely rare to find in this country, and, as far as we know, we are the only nursery in the UK to be offering these rare but delicious grape varieties. What are 'Strawberry' grape vines? They are grafted (see below) hybrid grape vines that have evolved from the Northern Fox Grape called Vitis labrusca. They are highly prized by both Californian vineyards, and European vineyards for their very sweet, very fruity flavoured grapes that give that amazing fresh fruit flavour to wines such as Ernest & Julio's Turning Leaf and White Grenache. You have never tasted anything like a 'Strawberry' grape fresh off the vine - it tastes just very sweet, and is ideal for juice on the table, and you can also use it for jam, jelly, and preserve making, as well, of course, in wine. Requires a warm sheltered wall for grapes to ripen. Vitis 'Phoenix' is one of the two new German hybrids that have been bred specifically for the UK climate. It is very disease resistant, cold hardy, early cropping, and vigorous. This variety is one of the best for edible table grapes that can be harvested straight off the vine and eaten. The grapes, which are very large, have a nice muscat flavour, and will ripen a golden colour in early October. This is a commercial vineyard quality GRAFTED vine. A famous older variety used to make a distinctive wine the world over. A lovely wine and eating grape, red, full of flavour. Vitis 'Regent' is one of the two new German hybrids that have been bred specifically for the UK climate. It is very disease resistant, cold hardy, early cropping, and vigorous. This variety of grape is delicious as a table grape eaten straight from the vine; lovely and sweet and full of flavour - it also makes a very good wine with a distinct, fruity red flavour. This is a commerical vineyard quality GRAFTED vine. One of the oldest grown grapes, this variety originates from Germany, and has been grown there since the 1400's. It is one of the most cold-hardiest of all grape vines, and can be planted ANYWHERE in the UK. Lovely white grapes make a wine with a apple aroma and distinctive fruity flavour. The Reliance variety is a full flavoured red SEEDLESS grape which will fruit in this country and is fully hardy. This is a commercial vineyard quality GRAFTED vine. Vitis 'Saint Laurent' is a rarely available grape vine, grown by commercial vineyards in Austria and Slovenia for it's cold tolerance and ability to cope with wet and cold together. It is a lovely, red-pink grape that makes a very berry-fruit tasting rose wine. A vigorous vine, this grape variety will easy cover a pagoda or trellis in two seasons. Early ripening white variety, very aromatic, producing dry wines. Vitis 'Steuben' is a labrusca hybrid with distinctly spicy flavour - a lovely blue abundant grape that can be used for juice or as a table grape. Rarely available. You have never seen anything quite like the spectacular colours of the Fire Grape Vine, Vitis 'Brandt'. One of the most vigorous grape vines available, it can cover an arbour in just one season(!). It fruits madly with bunches of black grapes, but this grape vine is mostly grown for it's magnificent autum foliage. Take a look at the picture to the right - this was taken of our own vine last autumn - incredible scarlet red with yellow veins, and these leaves cover the vine all through late summer to early winter. It has been the talking point of our garden for the last 3 years. The bottom photo shows some of our large 8ft-9ft specimens in November with Autumn colour. . The ornamental Giant Crimson Glory Vine is the ideal selection to cover a large wall or fence quickly. Huge leaves are green in Spring and then turn vivid crimson and reds in the autumn. We have some very large 20litre specimens available now. The ornamental Red Flame Vine, Vitis Spetchley Red, is grown for it's spectacular autumn display of fire red leaves. Darkening with each day of autumn, the leaves turn from purple to crimson to a deep scarlet. On a large vine, covering a pagoda, this can give a most dazzling late autumn display. This is a FULLY HARDY vine, able to withstand harsh winters, and is quite vigorous. It has edible black grapes, but is really grown for its wonderful foliage.